UPDATE: This primer is for Hero, the prerelease of Flex 4.5. 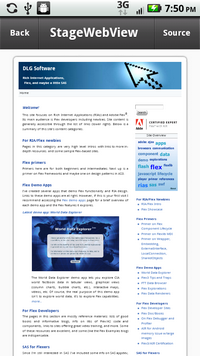 For a version updated for Flex 4.5 see my Primer on Mobile App Development with Flex 4.5. This primer provides an overview of mobile application development using Hero, the preview release of Flex 4.5. It includes some information specific to Android. While this primer includes links to numerous resources (blog posts, docs, books) one Adobe doc stands out so I'll highlight it at the start. Developing Mobile Applications with ADOBE FLEX HERO is an in-depth developer guide and is probably the definitive resource on the topic (link provides access to online and pdf versions). To develop Hero apps you'll want Burrito, the preview release of Flash Builder 4.5. So far I haven't seen a lot of changes from Flash Builder 4 except for the new features to support mobile app development (well, there's also the bidirectional Catalyst stuff, but I haven't played with that). As for Burrito installation, I don't have any personal caveats or cautions because my install was straightforward — I had not a single problem getting this up and running (thank you Adobe!). MS Win users, before you can use Burrito to deploy an app to your phone you need to install a USB driver for your phone. Burrito itself includes a link with info on this — go to the pulldown menu Run / Run configurations… and next to the "Launch Method" option's "On Device" radio button there's a link that addresses this config issue. This primer won't cover Burrito features targeted for mobile dev, but I have links on this below. The most comprehensive resource on Burrito is the Adobe doc Using ADOBE FLASH BUILDER BURRITO. This section summarizes Hero features. Later sections drill into more detail. The Adobe Hero doc also covers some mobile-specific design issues — for example, see Chapter 7. And here is the Devnet page for Mobile and Devices. Suffice to say that your UI design and app architecture for mobile will differ (sometimes significantly) from that of your traditional Flex apps. And this is where Hero helps you out — it includes many features that support/encourage good mobile design. Hero provides functionality to support design patterns common in the mobile world. A lot of this involves data persistence and navigation. Hero provides a memory-efficient mechanism for navigating between views (View is another new Hero class, for now just think of it as a full-screen container). Hero also provides data persistence features that help you maintain state for individual views and even your entire application. The root class of your Flex/AIR Mobile app will be Spark's new MobileApplication class, not Application or WindowedApplication. "Note: Mobile applications with multiple sections are not supported in this release. Therefore, do not use TabbedMobileApplication or TabbedViewNavigator on your applications." Obviously this is likely to change with the final release of Flex 4.5. When you create a mobile app (File/New/Flex Mobile Application) Burrito creates both your application root class (an instance of Spark's MobileApplication class) and a default home screen (an instance of Spark's View class). You define your UI in the views, not in your root class (though you can put code in the root class). During development you create the views you need (File/New/MXML Component) and within those view containers you define your UI. Then at runtime you navigate between views using features of the new ViewNavigator class. MobileApplication creates an instance of ViewNavigator for you and it is available to all views through their navigator property. The ViewNavigator itself creates an ActionBar instance that is shared by all views. This actionBar is basically a container that can appear docked above your view and is commonly used for title or message text and option controls. As for defining your UI, for the preview release Adobe recommends use of a limited Spark component set (currently only a subset of Spark components have been given mobile skins). These mobile-ready controls are listed in "Developing Mobile Applications with ADOBE® FLEX HERO" (see here or page 4 of the pdf). As for using MX controls in your UI, in general you should not use any mx controls in a MobileApplication project. In fact, by default the mx controls are not even in the path (no xmlns for mx). However, Adobe does say that if you want to include charts in your mobile app you can use the mx datavisualization controls. Again, for details see here or page 4 of the PDF). A good intro into Hero is the new Tour de Flex Mobile. 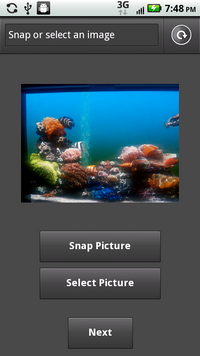 Install it from the Android marketplace and see this stuff in action, with source code provided. Mobile development using Adobe Flex SDK "Hero" and Flash Builder "Burrito"
Every MobileApplication has a ViewNavigator instance that provides much of your app's mobile-specific functionality. In addition to creating views and providing view navigation the navigator provides an optional and configurable ActionBar that can appear atop your view and can contain UI controls. To interactively explore the parts of the Hero mobile app I recommend installing Tour de Flex Mobile on your phone and then using its "Mobile App Anatomy" option. ← This view's content area is completely filled with a StageWebView instance, but as with any container you can populate it with whatever components you need. View is a subclass of Group. An ActionBar has three parts: a titleContent area, a navigationContent area (left of title area) and an actionContent area (right of title area). You have total control over what appears in these areas through properties of the View class. For example, View.title sets the text in the titleContent area. 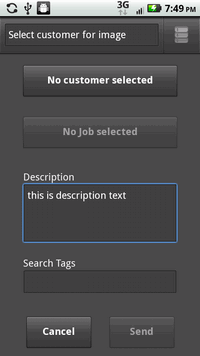 But you can also put your own components in this area using the titleContent property. See Hero doc's section "Spark ActionBar control" for details and several usage examples. Remember, you have total control over what displays in the actionBar (or whether the actionBar displays at all). As noted above, a view is basically a container where you place your user interface controls and the code that drives them. What makes this container different from other Spark containers like Group and SkinnableContainer is that View has properties and methods specific to the Hero mobile architecture. In essence it's a "ViewNavigator-aware" container. I won't cover Hero's session persistence features (enabled through the sessionCachingEnabled property of the MobileApplication and TabbedMobileApplication classes). To read more about this see the Hero doc's sections titled "Session persistence" and "Data Persistence". Of course, you can also roll your own persistence mechanism — a good place for using SQLite, which is integrated into the AIR runtime. See Jon Campos' post on this. 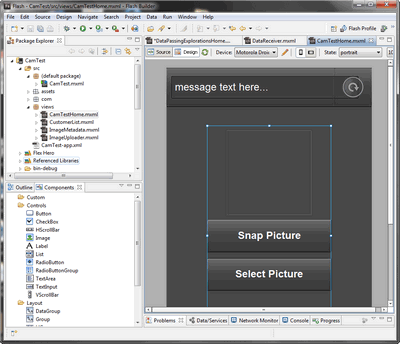 For a diagram of a view's lifecycle including the firing order for events like VIEW_ACTIVATE and VIEW_DEACTIVATE see the section "The life cycle of the Spark ViewNavigator and View containers" in "Developing Mobile Applications with ADOBE® FLEX® HERO". It's also covered in the View design doc mentioned next. Here is Adobe's design doc for View (and ViewNavigator), really interesting reading, though it's just a design doc so actual implementation sometimes varies from doc specifics (e.g., poppedViewReturnObject was renamed returnedObject, replaceView method was not implemented, etc.). And Mihai Corlan has many thoughtful posts on Flex, here's one on Hero. To navigate between views you can use the ViewNavigator class. MobileApplication creates a ViewNavigator instance at startup and makes it available to all views though their navigator property. View navigation is done via stack push and pop operations. When your app starts up the Flex framework will display your home view. This is the view you've assigned to your MobileApplication's firstView property. When you create a MobileApplication in Burrito (File / New / Flex Mobile Project) an initial view is created for you in a views package. By default it will be named [your-project-name]+"Home". From this home view you can display another view through a push operation (navigator.pushView(MyOtherView); ). More views can be added to the stack with more push operations. 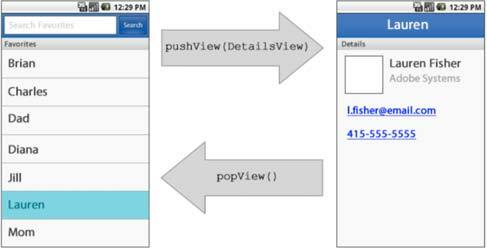 Let's consider a simple example where a home view uses another view to display detail information (image from page 10 of Developing Mobile Applications with ADOBE® FLEX® HERO). Note that in Hero apps the Android back button takes you back to the previous view (i.e., it executes a popView()). This is Hero built-in behavior implemented by the ViewNavigator class — you do not need to do anything to enable this native Android behavior. I'm working on a Hero tips post related to this. For now just let me mention that you can't inhibit this native behavior by listening for an Android back button press and then simply stopping the popView through preventDefault() — doesn't work in Hero. When you pass data into a view it is assigned to the view's data property. In that way a view is a bit like a Flex ItemRenderer. That is, upon instantiation its data property is populated with the data to be rendered and you use this to populate your view components (e.g., msgline.text=data.msgText). Note that Hero also includes "real" mobile-optimized renderers like MobileItemRenderer but I won't be covering them in this version of the primer. 2. In the view you've popped to you include a creation-time check of the returnedObject property. If it's not null then the assumption is that you just got popped to, and the "popper" has passed you some data. Obviously how you handle that returned object is up to you. Of course, there are other (and arguably better) ways to persist data across views. You might want to consider using a model to store your data (model as in Model-View-Controller). Since mobile apps are by nature fairly simple you may even want to use a Singleton ModelLocator (basically, the same approach used by Cairngorm and PureMVC). This lets you centralize data so it's available to all views. Just instantiate it in your app's root class (the one with the MobileApplication root tag) and it will persist even as your individual views come and go. A downside of this is that each view becomes tightly coupled to that ModelLocator, since they must must "know about" (have dependency on) that ModelLocator to read and write this data. see the Hero doc's section "Spark ViewNavigator and View containers"
Hero lets you interface with OS apps (e.g., invoking the Droid's camera, cameraRoll, the dialer, etc). When you invoke one of these apps your app goes into background mode and a DEACTIVATE event will fire. If control returns to your app an ACTIVATE event will fire. For example, if you invoke CameraRoll then when the user selects an image an ACTIVATE event will fire as your app returns to foreground. Keep this behavior in mind if you are thinking of using those events to trigger view initialize and cleanup activities. O'Reilly is about to publish a book on developing AIR apps for Android, "Developing Android Applications with Adobe AIR". It's an excellent intro to the topic, though be forewarned that it doesn't spend a lot of time on Hero/Flex. You can order the Rough Cuts version now.